Michael Flynn’s resignation Monday after 24 days on the job set a new low for the tenure of a national security adviser. William H. Jackson, who served in the Eisenhower administration, previously had the shortest tenure at about three months. President Dwight D. Eisenhower created the position in 1953 and Jackson was the third person to serve in the role. He was the acting head of the national security council and stepped down at the end of Eisenhower’s first term in early 1957. Flynn resigned amid questions about his contacts with Russia and forthrightness with members of the administration. 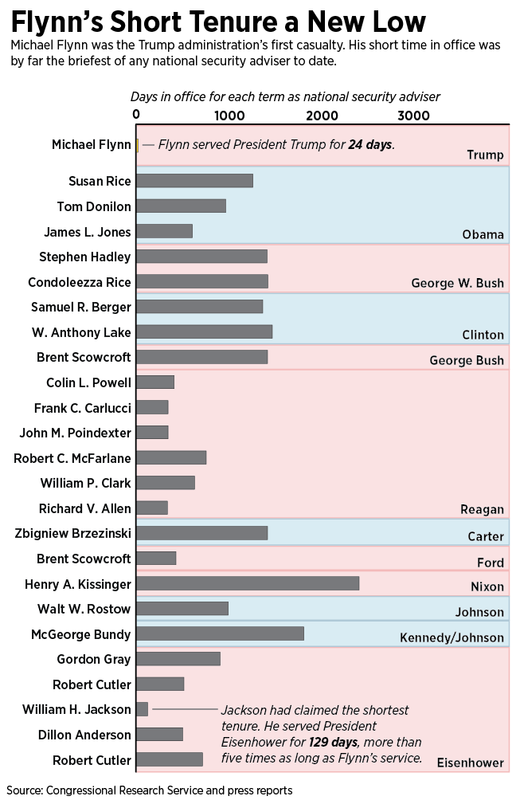 While he had by far the shortest tenure of any national security adviser, Flynn was not the first to run into trouble. President Ronald Reagan’s advisers Robert C. McFarlane and John D. Poindexter were caught up in the Iran-Contra affair. Poindexter’s conviction was thrown out by an appeals court panel in 1991. McFarlane was pardoned by President George H.W. Bush the following year, but not before he had attempted suicide and pleaded guilty to four misdemeanors. President Bill Clinton’s national security adviser, Samuel R. Berger, went on to serve as an adviser to the John Kerry presidential campaign and pleaded guilty in 2005 to removing and destroying classified documents from the national archives during a review of intelligence following the Sept. 11 terrorist attacks. Recent Cabinet officials, in contrast to those at the national security adviser post, have all lasted through at least the first year of their president’s tenure. No other incoming Cabinet member left earlier than a year into their service since at least the beginning of President Jimmy Carter’s term, according to data compiled by the U.S. Senate.